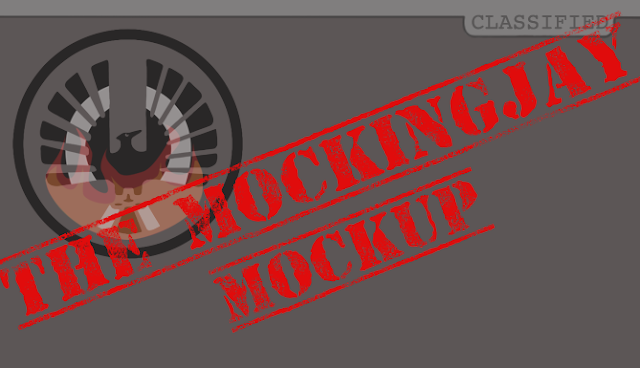 Welcome back to The Mockingjay Mockup!! If you are just coming to the party you can read all about what our new series entails HERE. For those of you who want the short version, here it is: Tiffany and I (Courtney) thought it would be super nifty if we mapped out the plot structure of splitting Mockingjay into two parts. We really think to not split this into two movies would compromise the integrity of the book, so we researched our butts off and now we are proud to present our weekly series: The Mockingjay Mockup! 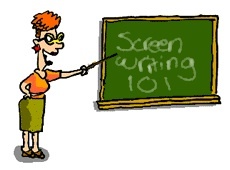 To kick off we thought we'd give a little mini lesson about movie structure. BASIC movie structure. Mockingjay is a very complex story alone with multiple storylines and relationships, so it is possible that when the initial drafts are written, they could very well be following an entirely different structure than the one we are following. 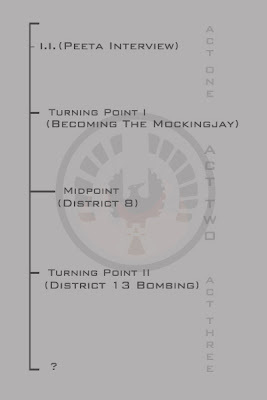 But we had to map Mockingjay using some kind of model, so we stuck with the basic so as to not confuse ourselves into oblivion. 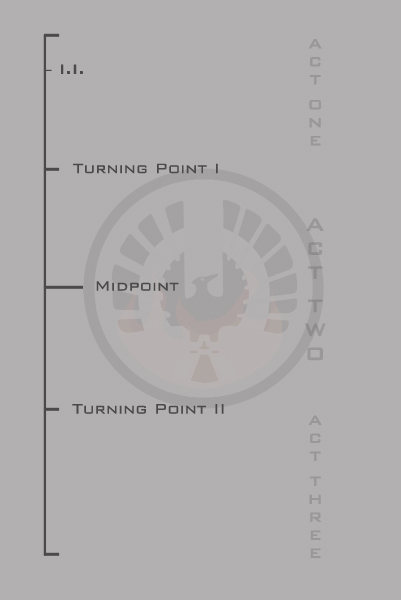 Turning point I is an event that defines what will happen in act 2. 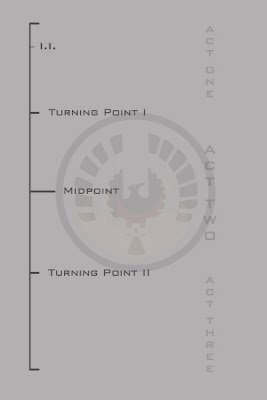 The midpoint is often a "no going back" situation, a call to action, or changes the perspective of the rest of the story. Turning point II is what's sometimes called "hero's darkest hour", at any case a definite setback. While there's more than just these to movie structure, we're not going to go into too much detail so as not to bore you guys to tears. But please, allow me one more important point! Just a little ways into the first act, there is a certain event called the Inciting Incident. This is basically the event that sends the entire movie into motion. For example, The Hunger Games Inciting Incident would be when Prim gets reaped. We've only plotted this in Part I since Part II is a continuation, thus no I.I. is needed. Next time on The Mockingjay Mockup we will start filling in the gaps and talk about the importance of these events and what purpose they serve in movie structure. 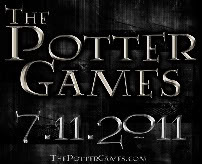 But most importantly, we will also talk about what event that splits the books, and why it's the best way to go. Stay tuned!